The Troup Hurt House and the four-gun DeGress Battery, which were temporarily captured by Confederate infantry on the afternoon of July 22, 1864. 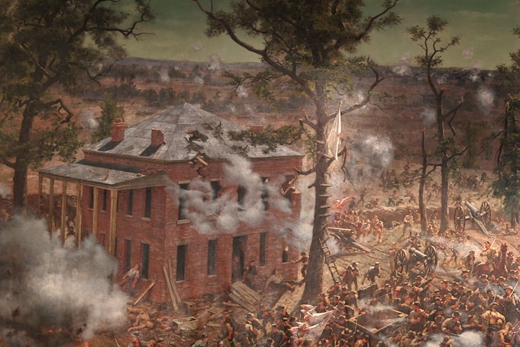 Battle of Atlanta painting, Atlanta Cyclorama. As the 150th anniversary of the Battle of Atlanta approaches, the Emory Center for Digital Scholarship (ECDS) at Emory University will launch a self-guided mobile tour of battle-related sites throughout the city — complete with maps, historical information, photos and videos, and even parking suggestions for those who drive the route. Battle of Atlanta Scholar Daniel Pollock poses at the McPherson Monument in East Atlanta, a point of interest on the digital tour. Emory Photo/Video. A launch celebration and demonstration will be held Wednesday, June 18, at 7 p.m. at the Atlanta Cyclorama & Civil War Museum. Another event, planned for July 17 at Emory's Robert W. Woodruff Library, will include a small exhibit of historical photos and materials from its Manuscript, Archives and Rare Book Library (MARBL) related to the Civil War and the Battle of Atlanta, which took place July 22, 1864. Designed to enrich people's understanding of Atlanta and its history, the smartphone-friendly tour will provide GPS directions and mapping, historical information about each of its 12 stops, and multimedia content including video and historical images. It requires no download and will be accessible via a web link, BattleAtl.org, which will go live to coincide with the June 18 event. The mobile tour is part of an ECDS team project that includes Daniel Pollock, a physician at the CDC (Centers for Disease Control and Prevention) and a Battle of Atlanta scholar; Allen Tullos, ECDS co-director and Emory history professor; Brian Croxall, project coordinator and ECDS digital humanities strategist; Jay Varner, chief software developer for the project; Kevin Glover, Emory web developer; Chris Sawula, history graduate student, ECDS fellow and photo researcher; and Erica Bruchko, a U.S. history and African American studies librarian at the Woodruff library. Digital mapping that matched each historical spot with its modern-day location was done by geospatial librarian Michael Page, another member of the project team. The stops are set up in chronological order of the Battle's events, but the tour can be stopped or started at any point. It concludes at the Atlanta Cyclorama, where an enormous circular painting of the Battle of Atlanta is displayed. "Atlanta played a significant role in the Civil War," Pollock says. "The Battle of Atlanta was a turning point in a very important campaign that began in early May 1864 and culminated with the fall of Atlanta on Sept. 2. It was the biggest battle in that campaign and the most consequential, and it took place in our midst." Leggett's Hill, where the battle's most ferocious fighting took place, now the intersection of Moreland Avenue and I-20. 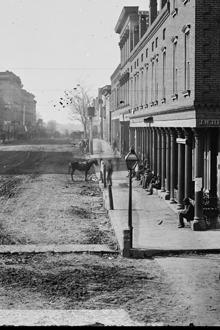 Street view of Atlanta in 1864, taken by Civil War photographer George Barnard. Credit: Library of Congress. Many important Battle of Atlanta sites have been replaced by service stations, interstates, buildings and other signs of urban growth. Still, there are surviving topographical features of the sprawling battlefield and many reminders of key events, recorded on historical markers placed just prior to the Civil War centennial in the 1950s, Pollock says. "This application is the 21st century version of a historical marker," Croxall adds. "Markers only fit so much text, and you don't know they're there until you come across them." Another benefit is that ECDS licensed the tour software as open-source and will make it available to others who want to create their own tours, Croxall says. Pollock had been studying the Battle of Atlanta for more than 20 years and giving periodic tours when his friend, Tullos, suggested that his tour could be turned into a self-guided, GPS-driven mobile app with help from ECDS. Work on the project began in August 2012. The mobile tour is a companion piece to an article published in Southern Spaces, an Emory-based digital, peer-reviewed journal now in its 10th year. The article, written by Pollock, provides expanded information about the Battle of Atlanta and the 12 tour stops. "It's been exciting to work on, and it's been a very collaborative project," says Tullos, who also serves as senior editor of Southern Spaces. He adds the project was particularly rewarding for Pollock, who not only has been able to share his knowledge of the Battle of Atlanta with a wider audience, but also acquired a great collection of images from reunion events that occurred for decades after the Civil War. Those images are accessible via the Southern Spaces article. Information on the July 17 event will appear on the Woodruff Library website closer to the date.